All the candidates that participated in the Adeyemi College of Education 2017/2018 academic session DEGREE post UTME screening exercise can now check their admission status. ACEONDO Degree admission list has been uploaded on the institution’s admission status checking portal. 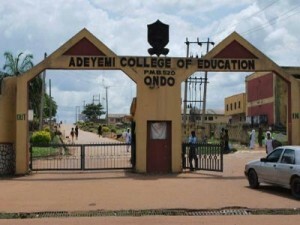 Go to http://www.aceondo.edu.ng/latestnews/2017/12/14/20172018-utme-degree-first-batch-merit-list to check your admission status on Adeyemi College of Education portal. Congratulations to all the candidates that made it to Adeyemi College of Education degree admission lists.